Philippine President Rodrigo Duterte approving and adopting the Executive Order (EO) No. 5 to eliminate poverty and hunger in the Philippine country. The executive order will adopt 25-year long-term vision of the National Economic and Development Authority (NEDA). 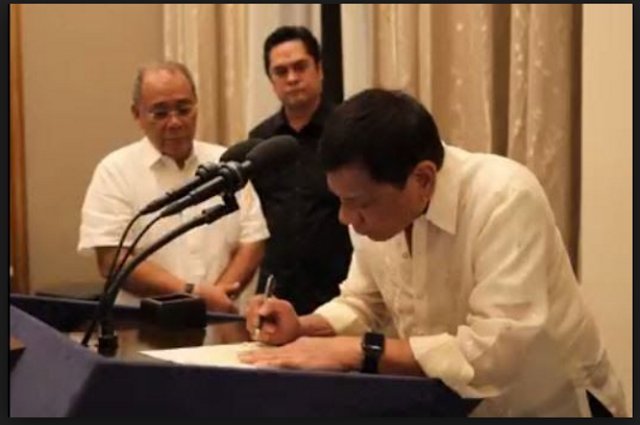 “The Philippine government hereby aims to triple real per capital incomes and eradicate hunger and poverty by 2040, if not sooner,” the executive order read. “The four medium-term Philippine Development Plans (PDPs) to be crafted and implemented until 2040 shall be anchored on the ‘Ambisyon Natin 2040.’ The PDP shall ensure the sustainability and consistency of strategies, policies, programs, and projects across political administration,” the order read. “In 2040, we will all enjoy stable and comfortable lifestyle, secure in the knowledge that we have enough for our daily needs and unexpected expenses, that we can plan and prepare for our own and our children’s future. Our family lives together in a place of our own, and we have the freedom to go where we desire, protected and enabled by a clean, efficient and fair government,” the NEDA said.